7 Drawer Dresser by Jamieson Import Services, Inc.
Foliage 7 Drawer Dresser by Jamieson Import Services, Inc. Beautifully crafted from sustainably-harvested solid wood, this dresser is a stunning storage piece for your bedroom. 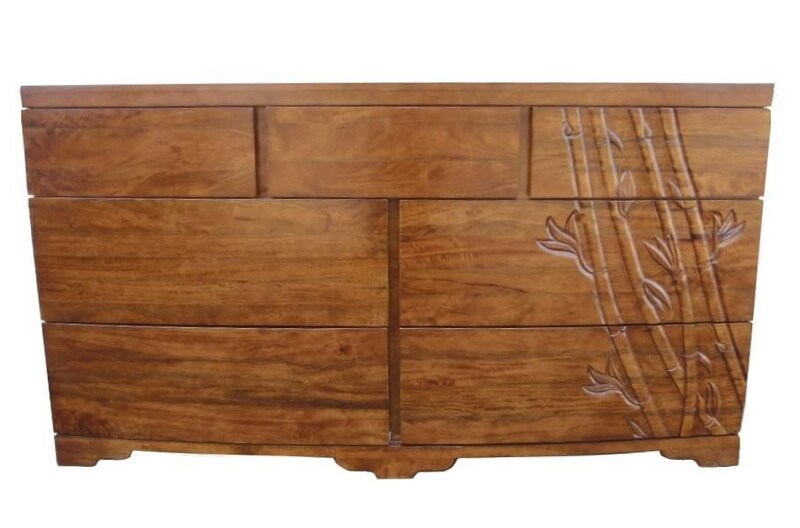 Seven drawers ensure ample space for your clothing and accessories, decorated with a carved bamboo motif. Bring the natural grace of the outdoors inside with this beautiful carved dresser. The Foliage 7 Drawer Dresser by Jamieson Import Services, Inc. at HomeWorld Furniture in the Hawaii, Oahu, Hilo, Kona, Maui area. Product availability may vary. Contact us for the most current availability on this product. Manufacturer Jamieson Import Services, Inc.
Drawer Suspension Drawer glides are German engineered ball-bearing glides. The Foliage collection translates the natural beauty of the outdoors into rustic and elegant furniture pieces for the bedroom and dining room. Pieces are crafted from sustainably harvested woods that emit warm tones, with a unique carved bamboo motif decorating each piece. Storage abounds throughout the collection, for functional, stylish furniture that you can feel good about in your home. The Foliage collection is a great option if you are looking for Transitional furniture in the Hawaii, Oahu, Hilo, Kona, Maui area. Browse other items in the Foliage collection from HomeWorld Furniture in the Hawaii, Oahu, Hilo, Kona, Maui area.